Turning your handwritten notes into digital files has many advantages, like being able to read and share them whenever and wherever you are. 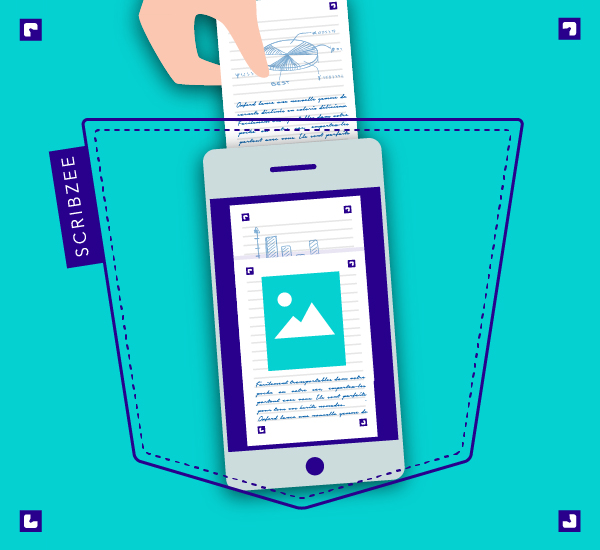 To do this, though, you need to use the right kind of tools to make clean scans… And, compared to scanning documents using a smartphone’s camera, the SCRIBZEE® application is leagues ahead! If you’ve already tried taking photos of your handwritten notes using your smartphone’s camera, you’ll appreciate that it isn’t very easy or conclusive! Doing so requires you to elevate your smartphone above the sheet so that you can fit everything in whilst at the same time staying as still as possible to avoid making your notes fuzzy and unreadable. After doing this you have to crop the photo to remove the edge of the table which crept into the shot. What’s more, saved to the photos folder on your smartphone, you have to trawl through countless other images before being able to find it… In the end, lots of time has been wasted doing something which was meant to save you time. With SCRIBZEE®, you can say goodbye to limitations and poor quality scans. Using the 4 corner markers incorporated into the pages of all smart Oxford products, the application automatically detects the text area to be processed and only scans this area! Don’t worry about lighting levels, your smartphone’s flash is turned on as soon as the scan begins. As regards the perspective, it’s instantaneously corrected which means there’s no need to twist your body into all manner of shapes trying to get the perfect result. All of your scans can be filed by subject: French lessons, Monday meeting, etc. You can then retrieve them in the blink of an eye by simply opening your application. Lastly, the application’s advanced functions mean that you can create a single file using several scanned pages, invert or delete notes and add other images… Without forgetting to share them instantaneously on social media, by email or by text message. Previous Post:Business meetings: save time and work more efficiently with SCRIBZEE!